General Sir Archibald James Murray GCMG, KCB, CVO, DSO. General Sir Archibald James Murray GCMG, KCB, CVO, DSO (23 April 1860 - 21 January 1945) was a British Army officer during the Great War, known as commander of the Egyptian Expeditionary Force from 1916 to 1917. I have the honour to submit a report on the operations of the Force under my command from 1st March to 28th June, 1917. 1. 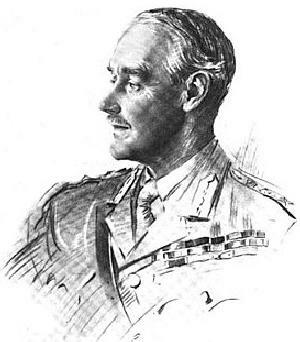 At the beginning of March the Eastern Force, under the command of Lieut.-General Sir Charles Dobell, K.C.B., C.M.G., D.S.O., was concentrated in the neighbourhood of El Arish. The headquarters of the Desert Column, under the command of Lieut.-General Sir P. Chetwode, Bt., K.C.M.G., C.B., D.S.O., were at Sheikh Zowaiid, in advance of which place the mounted troops of the column were covering the construction of the railway, which was being: rapidly extended along the coast towards Rafa. Our mounted patrols, -as I reported in my last, despatch, had on 28th February entered the village of Khan Yunus, which had been evacuated by the enemy. Every preparation was being made for an attack in force on the strong position at Weli Sheikh Nuran, upon which the Turks had been working incessantly since the beginning of January. On 5th March, however, aeroplane reconnaissance established the fact that the enemy had decided not to face our attack and was evacuating this carefully prepared position. I at once instructed the General Officer Commanding, Eastern Force, to do all that was possible either to prevent this evacuation or to inflict loss on the enemy during its execution, and the Royal Flying Corps were ordered to carry out bomb attacks with the utmost energy against the enemy's communications. Accordingly on 6th March .and the following days vigorous attacks were made by our aircraft on the railway at Bir Saba, Tel el Sheria and the junction station on the Jerusalem—Ramleh line; but it was found impossible for our infantry or mounted troops to make any effective move against the enemy, owing to the distance between railhead and Weli Sheikh Nuran. The enemy had retired while he was still out of reach, and his troops, which then consisted of about two divisions, were subsequently distributed between Gaza and Tel el Sheria, with a small garrison at Bir Saba. It thus became necessary to meet an altered situation, which was complicated by complete uncertainty as to the line on which the enemy would ultimately elect to stand, and also to decide on the method and direction of my advance in Palestine. I decided that it would in any case be unwise to make an attempt on Bir Saba, since by so doing I should be drawing my line of communications parallel to the enemy's front, and there was no technical advantage to be gained by linking up the military railway with the Central Palestine Railway, either at Bir Saba or Tel el Sheria. The true line of advance was still along the coast, since the enemy was no less effectually threatened thereby, while my line of communications was more easily protected and railway construction was more rapid, owing to the absence of gradients. The coastal district, too, was better supplied with water. I decided therefore to continue for the present a methodical advance up the coast, moving troops forward as the railway could supply them, together with energetic preparation of the force for an attack in strength as soon as the state of its communications should make that possible. The most important thing was to increase the radius and mobility of the striking force. The Desert Column was therefore reconstituted to consist of the two cavalry divisions each less one brigade)—the concentration of the Imperial Mounted Division, under Major-General H. W. Hodgson, C.V.O., C.B., being completed at Sheikh Zowaiid by 16th March—and the 53rd Division, together with light armoured motor batteries. Local arrangements were also made by which improvised trains, both of horses and camels, should be available for the three infantry and two cavalry divisions in* the Eastern Force. 2. By the middle of the month the railway had reached Rafa, and the work of making a large station there with the requisite sidings was being rapidly pushed on. The Desert Column was between Rafa and Sheikh Zowaiid, the 52nd Division was at Sheikh Zowaiid and the 54th Division between that place and El Arish. There were distinct indications that the enemy intended to withdraw his troops without a fight from the Gaza—Tel el Sheria—Bir Saba line, a move which it was highly important to prevent, while it was necessary to seize the line of the Wadi Ghuzze in order to protect the advance of the railway from Rafa towards Gaza. The chief difficulty lay in deciding, in view of these considerations, the exact moment when it would be wise to abandon the methodical advance and to push out to its full radius of action a considerable force into a 'country bare of all supplies and almost devoid of water. I came to the conclusion that it would be necessary to push forward the Desert Column as soon as it could be supplied from Rafa Station, and the two other infantry divisions could be maintained in support of it between Rafa and the Wadi Ghuzze. It appeared that these conditions would be fulfilled shortly before the end of the month. I therefore instructed the General Officer Commanding, Eastern Force, to concentrate the Desert Column about Deir el Belah, a small village to the south-west of the Wadi Ghuzze, with one of the supporting divisions on the ridge to the east of Deir el Belah and the other in the neighbourhood of Khan Yunus, with the Imperial Camel Corps to cover the right flank of the force. When these dispositions were completed the Desert Column, with the Imperial Camel Corps attached, was to march on Gaza, thus giving the enemy the alternative of standing his ground and fighting or of submitting to the attacks of our cavalry on his flanks and rear should he attempt to retire. On 20th March, General Dobell moved his headquarters to Rafa, whither, on the same day, headquarters Desert Column moved from Sheikh Zowaiid. The further preliminary moves, covered by the cavalry, who on the 23rd approached very near the outskirts of Gaza, were completed without any hitch by the 25th March. By the evening of that date the whole of the Desert Column were concentrated at Deir el Belah. the 54th Division was at In Seirat under the hills to the east of Deir el Belah, the 52nd Division at Khan Yunus and the Camel Corns and armoured batteries about Abasan el Kebir. All preliminary reconnaissances had been carried out and the orders to the General Officer Commanding. Desert Column, were to advance on Gaza in the early hours of the following morning, the cavalry pushing out to the east and north of the town to block the enemy's lines of retreat, while the 53rd Division attacked Gaza in front. The 54th Division was to .cross the Wadi Ghuzze in rear of the mounted troops of the Desert Column to a position of readiness in the neighbourhood of Sheikh Abbas, a commanding ridge 5 miles S.S.E. of Gaza, where a position was to be selected suitable for defence against an attack from east or south-east. One infantry brigade and one artillery brigade of this division were to assemble at a convenient point to the west of this position, where they would be held in readiness to reinforce the Desert Column at short notice. One brigade group of the 52nd Division was to be brought up to replace the 54th Division at In Seirat. The enemy's main body was in the Tel el Neiile—Huj area, south of the Wadi el Hesi, covered by detachments about Gaza, Sheria—Hereira and Bir Saba. His strength appeared to be between two and three divisions. The object of this advance was threefold: firstly, to seize the line of the Wadi Ghuzze to cover the advance of the railway; secondly, at all costs to prevent the enemy from retiring without a fight; thirdly, if possible, to capture Gaza by a coup de main and to cut off its garrison. On 25th March I set up my Advanced General Headquarters at El Arish for the period of the operations, and on the following morning battle headquarters of Eastern Force were established just north of In Serait. 3. Early in the morning of 26th March the preliminary movements were begun and successfully accomplished. The Australian and New Zealand Mounted Division left its bivouacs at 2.30 a.m. and crossed the Wadi Ghuzze, closely followed by the Imperial Mounted Division. The leading division headed tor Beit Durdis. 5 miles east of Gaza having completed its crossing of the Wadi, by 6.15 a.m. The Imperial Mounted Division, after crossing the Wadi, headed due east for El Mendur, where it arrived at 9.30. The moves of the mounted divisions, as well as of the infantry, were considerably delayed by a very dense fog, which came on just before dawn and did not entirely clear till 8 a.m. This unavoidable delay had a serious effect upon the subsequent operations. The Imperial Camel Corps crossed the Wadi Ghuzze a little further south and also proceeded to El Mendur, where its role was to assist the Imperial Mounted Division in observing the enemy in the direction of Huj and Hereira, and to withstand any attempts to relieve Gaza from those directions. At 9.30 a. m. the Australian and New Zealand Mounted Division reached Beit Durdis, and pushed out detachments to the west, north and east. In the course of these movements the 2nd Australian Light Horse closed the exit from Gaza and rested their right on the sea. A detachment of these troops captured the Commander of the 5Srd Turkish Division, with his staff, while he was driving into Gaza; also a convoy of 30 Turks. Later in the morning the same force destroyed the head of a Turkish column with machine-gun fire as it debouched from Gaza in a north-easterly direction. The Imperial Mounted Division sent out patrols towards Hereira. Tel el Sheria and Huj, while two squadrons of a Yeomanry Brigade were placed astride the Bir Saba—Gaza road, about 5 miles south-east of Gaza, and one squadron was sent north to gain touch with the Australian and New Zealand Mounted Division. Later in the morning these squadrons found themselves engaged with enemy mounted troops, supported by bodies of infantry, and remained so throughout the day against continuously increasing numbers. They were also exposed to the fire of heavy guns at Hereira, and suffered some casualties in consequence. Meanwhile, the 53rd Division, under the command of Major-General A. G. Dallas, C.B., C.M.G., having thrown forward strong bridgeheads before dawn, crossed the Wadi Ghuzze at a point some 3 miles from the sea coast, with one brigade on the right directed on the Mansura Ridge, and another brigade on the left directed on El Sheluf, some 2 miles south of Gaza on the ridge running south-west from that place. A brigade was held in reserve and crossed in rear of the first-named brigade. The Gloucestershire Hussars, with a battalion and a section of 60-prs., crossed the Wadi near the sea coast, and for the remainder of the day successfully carried out their role of working up the sandhills to cover the left of the 53rd Division, and to keep the enemy employed between the village of Sheikh Ahmed and Gaza. At the same time the divisional Squadron secured a good gun position and an excellent observation station for another section of 60-prs. on the far side of the Wadi Ghuzze, in the neighbourhood of the main road from Gaza to Khan Yunus. The 54th Division, under the command of Major-General S. W. Hare, C.B., began to cross the Wadi at 7 a.m., and two brigades proceeded to take up a defensive position on the Sheikh Abbas Ridge, south-east of Gaza. These brigades remained in their positions throughout the day without coming into action. One brigade, with a brigade of field artillery, remained in the vicinity of the Wadi, so as to be at the disposal of the General Officer Commanding, 53rd Division, when required. During the morning this brigade was ordered to Mansura, to come under the orders of General Officer Commanding, 53rd Division, and it finally assembled at that point about 3.30 in the afternoon. After the preliminary reconnaissances had been completed, the 53rd Division commenced to deploy from the line El Sheluf—Mansura, to attack the AH Muntar position, with the following objectives:—One brigade astride the El Sheluf—AH Muntar Ridge on the enemy's southwestern defences; one brigade moving north from Mansura on the prominent Ali Muntar Ridge on the southern outskirts of the town; and one brigade, less one battalion in divisional reserve, pivoting on the right of the last-mentioned brigade on the hill 1,200 yards northeast of Ali Muntar, in co-operation with the attack of that brigade. The deployment of the leading brigades commenced at 11.50 a.m., and the brigade in reserve moved forward shortly afterwards to its assigned position. In co-operation with artillery fire and long-range machine-gun fire, the brigade on the left pressed forward along the ridge, and the remaining brigades over the flat, open ground, practically devoid of cover. The final advance, which began just after 1 p.m., was very steady, and all the troops behaved magnificently, though the enemy offered a very stout resistance, both with rifle and machine-gun fire, and our advancing troops, during the approach march, the deployment and attack, were subjected to a heavy shrapnel fire. About 1 p.m., General Officer Commanding, Desert Column, decided to throw the whole of the Australian and New Zealand Mounted Division against the north and north-east of Gaza to assist the infantry. Both mounted divisions were placed under the orders of Major-General Sir H. G. Chauvel, K.C.M.G., C.B., General Officer Commanding, Australian and New Zealand Mounted Division, with instructions that he should bring the Imperial Mounted Division further north to continue observing the enemy, while the Imperial Came? Corps was ordered to conform to this movement and observe the country from the right of the Imperial Mounted Division. About the same time, considerable enemy activity was observed on the roads leading north and east of Tel el Sheria and also about Hereira. By 3.30 p.m., General Chauvel had collected his division, with the exception of some detachments not yet relieved, and had commenced to move on Gaza, together with the 3rd Australian Light Horse from the Imperial Mounted Division. The attack was made with the 2nd Australian Light Horse on the right, with its right flank on the sea, the New Zealand Mounted Rifles in the centre directed on the continuation of the Ali Muntar Ridge and the Yeomanry, less one detachment on the left, east of the town. (Brigadier-General W. Marriott-Dodington), which had been placed at his disposal, to take this position. The brigade responded with the greatest gallantry in face of a heavy fire, and after some hard fighting it pushed home its attack with complete success, so that when darkness fell the whole of the Ali Muntar position had been carried and a footing gained on the ridge to a point about 1,200 yards northeast of that position. Meanwhile, during the relief of the observing detachments of the Australian and New Zealand Mounted Division by the Imperial Mounted Division, the enemy, pressing his advance vigorously from the east, had succeeded in dislodging our troops from a prominent position on the east of Gaza. To restore the situation on this flank, General Chauvel sent back the 3rd Australian Light Horse. Thanks to skilful leadership of Brigadier-General J. R. Royston, C.M.G., General Officer Commanding, and his promptness in taking up his position, the mounted troops, supported by horse artillery and motor batteries, were able to prevent any .further advance by the enemy from this direction. The attack of the Australian and New Zealand Mounted Division on the north of Gaza was pushed home with the greatest dash and gallantry, in conjunction with the infantry attack. The New Zealand Mounted Rifles was soon in possession of the redoubt of the ridge east of Gaza, while the Yeomanry on their left carried the knoll running west from that ridge. During these operations the Somerset Battery, Royal Horse Artillery, in support of the 2nd Australian Light Horse, silenced two enemy guns, and the New Zealand Mounted Rifles captured and retained, in spite of counterattacks, two 77-mm. guns, which they used with skill on small bodies of the enemy which were still in the occupation of houses in the vicinity. As a result, 20 prisoners were taken, and eventually the guns were safely brought away. The whole division then established itself amongst the cactus hedges on the outskirts of the town, all brigades overcoming serious difficulties in fighting their way through the cactus hedges, in spite of the stubborn resistance of the enemy. The Australian Light Horse, under the command of Brigadier-General G. de L. Ryrie, C.M.G., particularly distinguished itself in this phase of the operations. 5. When darkness fell, the situation was as follows: —Gaza was enveloped, and the enemy, in addition to heavy losses in killed and wounded, had lost 700 prisoners. The 53rd Division was occupying the Ali Muntar position, which it had captured, but its right flank was very much in the air, only a thin line of cavalry holding off the relief columns of continually increasing strength which were approaching from north and east. In support of this division, the 54th Division, less one brigade, was holding Sheikh Abbas, with its left about 2| miles from the flank of the 53rd. The Australian and New Zealand Mounted Division was very much extended round Gaza and was engaged in street fighting. The Imperial Mounted Division and the Imperial Camel Corps, on a very wide front, were endeavouring to hold off enemy forces. The majority of the mounted troops had been unable to water their horses during the day, and it appeared that, unless Gaza was captured during the day, they would have to withdraw west of the Wadi Ghuzze in order to water their animals. Strong columns of the enemy, with guns, were moving to the relief of Gaza from the north, north-east and south-east. It was at this moment that the loss of two hours' daylight made itself particularly felt, since, had two more hours' daylight now been available, there is no doubt that the infantry would have been able to consolidate the positions they had won, and for arrangements to have been made by which the 54th Division could have effected junction with the 53rd. It is perhaps possible that, if General Dobell had at this stage pushed forward his reserve (the 52nd Division) to support the 53rd the result would have been different, but the difficulty of supplying water for men and horses would have been immense and impossible to realise by those who were not on the spot. As it was, after consultation with General Officer Commanding, Eastern Force, the General Officer Commanding, Desert Column, in order to prevent the envelopment of his mounted troops, decided to withdraw them during the night; he therefore directed General Chauvel to break off the engagement and retire his divisions west of the Wadi Ghuzze, using the Imperial Camel Corps to assist in his retirement. This movement made the maintenance by the 53rd Division of the very exposed position which it had captured no longer possible, and General Officer Commanding, Desert Column, reluctantly ordered General Officer Commanding, 53rd Division, to draw back his right and gain touch on that flank with the two remaining brigades of the 54tb Division, which had already been ordered by General Officer Commanding, Eastern Force, to fall back westwards from Sheikh Abbas and take up a line on the El Burjaliye Ridge, running south-westwards from Mansura, with their left in touch with the brigade of the 54th Division, which was to fall back from its line south of Ali Muntar and establish an outpost line further back, with its right in touch with the remainder of its division. These movements were carried out during the night, the 53rd and 54th Divisions converging so that their inner (or northward) flanks rested one on the other, their lines running along the El Sire and El Burjaliye Ridges respectively, the Imperial Camel Corps closing the gap between the right of the 54th Division and the Wadi Ghuzze. The retirement of the .mounted troops was accomplished without difficulty, though during the movement the 3rd Australian Light Hors» became engaged with the enemy advancing from the direction of Huj, but succeeded in driving them off with the assistance of a light car patrol. At dawn on the 27th, two light armoured motor batteries found themselves in the middle of a large body of the enemy, but brilliantly extricated themselves, causing considerable casualties to the enemy. 6. The withdrawal of the cavalry and the retirement of the 53rd Division on to the El Sire Ridge, enabled the enemy to reinforce the garrison of Gaza with considerable bodies of troops. At daybreak, nevertheless, reconnoitring patrols from two brigades pushed forward, seized the positions up to and including the Ali Muntar Hill which had been captured on the day before. They encountered some resistance, but drove the enemy out and established themselves on this line. At 8 a.m. the 53rd Division and the Imperial Camel Corps passed under the direct command of General Officer Commanding, Eastern Force. As soon as the advanced parties of infantry were established in the recaptured positions, preparations were made by the General Officer Commanding, 53rd Division, to reinforce them, but before the reinforcements could reach their objective a strong counter-attack was made by fresh Turkish troops, which were pouring; in from the north and north-east. This counter-attach drove our patrols out of the position on AH Muntar Hill, though further advance from it on the part of the enemy was prevented by our artillery, and our infantry still held the rest of the positions. Since, however, the junction of the right of the.53rd Division and the left of the 54th made an acute salient exposed to attack on three sides, it was necessary to withdraw the line here so as to eliminate the acute angle. In addition to the Turkish reinforcements coming from the east and north-east against Ali Muntar, another body appeared early in the morning on the Sheikh Abbas Ridge, which they occupied. From this point they directed artillery fire on the rear of OUT positions on the Mansura Ridge, doing a certain amount of damage among the transport animals and making any movement of camel transport during the day impossible. Our position.-1 were also exposed to heavy artillery fire from the north. Nevertheless, though tired and ill-supplied with water, the 53rd and 54th Divisions, now placed under the command of the General Officer Commanding, 53rd Division, remained throughout the day staunch and cheerful and perfectly capable of repulsing with heavy losses to the enemy any Turkish counterattacks. At no point was any enemy attack successful, and the Imperial Camel Corps, on the right of the 54th Division, in repulsing the attack by the 3rd Turkish Cavalry Division, practically annihilated the attackers. The position, however, was an impossible one to hold permanently. It was narrow and exposed to attack and artillery fire from three directions; also, it,was devoid of water, and hostile artillery fire made the approach to it -by day of slow moving camel convoys with water and supplies impossible. If it had now been practicable for the General Officer Commanding, Eastern Force, to advance with his three infantry divisions and two cavalry divisions, I have no doubt that Gaza could have been taken and the Turks forced to retire; but the reorganization of the force for a deliberate attack would have taken a considerable time, the horses of the cavalry were very fatigued, and the distance of our railhead from the front line put the immediate maintenance of such a force with supplies, water and ammunition entirely out of the question. The only alternative, therefore, was to retire the infantry, and this movement, after a strong counter-attack at 4 p.m. on the northern apex of our position had been shattered by our rifle, machine-gun and artillery fire, was carried out during the night at the order of General Officer Commanding, Eastern Force. By daylight the whole force had reached the western side of the Wadi Ghuzze and taken up a strongdefensive position covering Deir e Belah. The enemy made no attempt to advance on "the 28th, but contented himself with the occupation of the Gaza defences, our cavalry remaining in touch with him throughout the day. Arrangements were made on the 29th for the defensive line on the western side of the Wadi Ghuzze to be divided into sections to be held by the 54th, 52nd.and 53rd Divisions respectively, to cover the further progress of the railway which was just reaching Khan Yunus. 7. The total result of the first battle of Gaza, which gave us. 950 Turkish and German prisoners and two Austrian field guns, caused the enemy losses which I estimate at 8,000 and cost us under 4,000 casualties, of which a large proportion were only slightly wounded, was that my primary and secondary objects were completely attained, but that the failure to attain the third object-—the capture of Gaza—owing to the delay caused by fog on the 26th and the waterless nature of the country round Gaza, prevented a most successful operation from being a complete disaster to the enemy. The troops engaged, both cavalry, camelry and infantry, especially the 53rd Division and the brigade of the 54th, which had not been seriously in action since the evacuation of Suvla Bay at the end of 1915, fought with the utmost gallantry and endurance, and showed to the full the splendid fighting qualities which they possess. 8. Preparations were immediately begun for a second attack in greater force on the Gaza positions as soon as possible, though I instructed the General Officer Commanding, Eastern Force, that upon no consideration was a premature attack to be made. The station at Deir el Belah, where the headquarters of the General Officer Commanding, Eastern Force, had been set up on 30th March, was opened on the 5th April, and was rapidly developed into an important railhead. At this period the activity of hostile aircraft in bombing Deir el Belah and other advanced camps considerably increased, but little damage was done and all attacks were followed by vigorous retaliation on the part of the Royal Flying Corps. The troops were all concentrated ready for an advance and reconnaissances for artillery positions east of the Wadi Ghuzze were completed early in April, but the chief factor in fixing the date of the advance was our continual source of anxiety, the water supply. It was necessary for the next advance that two divisions should be able to water in the Wadi Ghuzze, where the prospects of obtaining water by well-sinking were small. Tanks therefore had to be set up in the Wadi, and arrangements made to pump rail-borne water from Deir el Belah over the In Seirat Ridge to fill them. The general plan of the attack had by this time already been decided. It was that the advance on Gaza with three infantry divisions and two cavalry divisions should .take place in two stages. The first stage would be the occupation of the Sheikh. Abbas—Mansura Ridge, south of Gaza, and its preparation as a strong point from which any flank attack could easily be repelled. A short, period .of development was to follow the first stage, during which water supply and communications would be improved as far as possible, heavy artillery and Tanks brought up and supplies advanced, so that the final stage—an advance on Gaza after a heavy bombardment — should be accomplished rapidly. Meanwhile, the enemy in front of me had been considerably reinforced, and had abandoned all intention of further retirement. It became clear that five divisions and a cavalry division had now appeared on our front with an increase in heavy artillery. . Not only were the Gaza defences being daily strengthened and wired, but a system of enemy trenches and works was being constructed south-east from Gaza to the Atawineh Ridge, some 12,000, yards distant from the town. This put any encircling movement by our cavalry out of the question, unless the enemy's line in front of us could be pierced and a passage made through which the mounted divisions could be pushed. Until that could be done the role of our mounted troops would be to protect the right flank of the infantry, whose attack in the final stage was to be on the same lines as the first attack. While one division advanced from the Wadi Ghuzze between the sea and the Gaza— Deir el Belah road, the two divisions occupying the Sheikh Abbas—Mansura Ridge were to attack the south-western defences up to the Ali Muntar Hill; the right division, after overcoming the enemy on its front, to pivot on its left against the defences north of Ali Muntar. The 17th. April was fixed as the first stage of the advance, and on the 15th April I proceeded to Khan Yunus, where I set up my Advanced General Headquarters. 9. For the first stage of the operations the dispositions of the General Officer Commanding, Eastern Force, were as follows: —The 52nd ; and 54th Divisions, the latter on the right, to seize and occupy the line Sheikh Abbas— Mansura—Kurd Hill (on the El Sire Ridge). The General Officer Commanding, 52nd Division, Major-General W. E. B. Smith, C.B., C.M.G., to command this attack. The 53rd Division, under the command of Major-General S. F. Mott, to remain in position just north of the Wadi Ghuzze between the sea and the Gaza—Khan Yunus road, but to carry out strong reconnaissances northward along the coast. The 74th Division to remain in general reserve in the vicinity of In Seirat. Of the Desert Column, now constituted of two mounted divisions and the Imperial Camel Corp, one mounted division was to be disposed about Shellal with the object of immobilizing enemy forces at Hereira, while the remainder of the column was to protect the right flank of the 54th Division. The enemy was disposed in a chain of detachments along the 16 miles between Sheria and Gaza, with strong trenches at El Atawineh (about 13,000 yards south-east of Gaza) and very strong defences, known as the Warren, the Labyrinth, Green Hill, Middlesex Hill, Outpost Hill and Lees Hill, running south-westwards along the ridge from Ali Muntar. This position, which commands all approaches to the town from the south-west, south and south-east, had been very strongly fortified and well wired, in addition to the natural obstacles formed by thick cactus hedges, had been made into a nest of machine guns, largely manned by Germans. The right of his line, between Gaza and the sea, ran in the arc of a circle west and south-west of the town. This section consisted of a double line of trenches and redoubts, strongly held by infantry and machine guns well placed and concealed in impenetrable cactus hedges built on high mud banks enclosing orchards and gardens on the outskirts of the town. .was detached from the Desert Column and placed under the orders of the General Officer Commanding, 54th Division. The 54th and 52nd Divisions, acting under the command of General Officer Commanding, 52nd Division, were to attack the Ali Muntar group of works, the 54th pivoting on the right of the 52nd and including in its objective the group of trenches at Khirbet Sihan, east or Gaza, the Imperial Camel Corps being attached to it for this purpose. The 53rd Division was to attack the enemy trenches in the sand dunes south-west and west of Gaza. the line Sampson Ridge—Sheikh Ajlin being its first objective. The 74th Division, in general reserve, was to advance and take up a position of readiness behind the Sheikh Abbas and Mansura Ridges. Of the Desert Column, the Imperial Mounted Division was to make a dismounted attack on the enemy's position at El Atawineh, part of the Australian and New Zealand Mountain Division to seize a spur at Baiket el Sana on the right of the Imperial Mounted Division, and the remainder to be held in re serve to take advantage of any success gained by the Imperial Mounted Division. The containing attack by the cavalry began at dawn, and by 10.30 a.m. the Imperial Mounted Division was on the line Gaza—Baiket el Sana Ridge, with its right refused, while the Australian and New Zealand Mounted Division had seized the ridge at Baiket el Sana. The Imperial Mounted Division, under shell and machine-gun fire, continued the attack on the Atawineh trenches with the greatest gallantry, but could make little headway. For the main attack, the bombardment opened at 5.30 a.m. The guns of the "Requin" and the monitors bombarded Ali Muntar and the works immediately to the south-west. These guns kept the enemy's defences and dug-outs under an accurate and sustained fire and were instrumental during the day in rendering several enemy counter-attacks abortive. At 7.15 a.m. the 53rd Division advanced on Sampson Ridge and Sheikh Ajlin, and at 7.30 a.m. the Imperial Camel Corps, 54th Division and 52nd Division advanced to the attack. The 53rd Division, though meeting with considerable opposition, gradually worked up to Sampson Ridge, which was carried by a brigade early in the afternoon. This enabled another brigade to carry the high ground between this position and the coast with little opposition, and the first objective of the division was attained. The remainder of the main attack was not so fortunate. The left brigade of the 52nd Division made good Lees Hill, the nearest point to our line of the enemy's defences on the AH Muntar Ridge, by 8.15 a.m., but on advancing beyond Lees Hill this brigade came under very heavy machine-gun fire from Outpost Hill, which checked its progress. This prevented any advance of the brigade, which was echeloned slightly in the right rear of the left brigade. A little later one of the Tanks came astride of the lunette on Outpost Hill, causing considerable loss to the enemy, but the infantry could not capture this lunette till shortly after 10 a.m. The Tank was unfortunately hit by three shells and burnt out. Meanwhile, the 54th Division, with the Imperial Camel Corps, had advanced steadily under fire on the right of the 52nd Division. Its left brigade was in advance of the right of the rear brigade of the 52nd Division, and thus exposed to a heavy enfilade fire from the direction of Ali Muntar. At 9.30 a.m. the left of this brigade was heavily counter-attacked, but the enemy were repulsed by machine-gun fire. On the right of this brigade another brigade fought its way forward against the enemy works between Gaza and Khirbet Sihan. One Tank advanced ahead of the infantry and inflicted heavy casualties on the enemy in a redoubt, but was afterwards hit by shell fire and burnt out. The Imperial Camel Corps, in conjunction with the 4th Australian Light Horse on its right, entered the enemy trenches at Khirbet Sihan by 9 a.m., the enemy withdrawing to a position some 800 yards to the north. The Imperial Camel Corps was unable, however, to advance beyond Khirbet Sihan, and the two brigades, 54th Division, in spite of most strenuous and gallant efforts to advance, were repeatedly checked by very heavy fire from this front Towards noon the left of the right brigade was forced back by a determined counter-attack from the north-east, and this left the other brigade in a critical position, but it stood firm until, assisted by a third brigade of this division, the right brigade was able to regain all the ground it had lost. The enemy counterattack against the right brigade was meanwhile continued against the 4th Australian Light Horse, which was forced to give ground, and, with the 3rd Australian Light Horse on its right, suffered heavy casualties. However, the Imperial Camel Corps, though in a critical position, held on till a Yeomanry brigade filled the gap and stopped the enemy's advance. Heavy shelling and machine-gun fire were directed at the line during the remainder of the afternoon. Meanwhile, the left brigade, 52nd Division, was shelled out of its position on Outpost Hill, but the position was most gallantly retaken on his own initiative by Major W. T. Forrest, M.C., King's Own Scottish Borderers (subsequently killed), who collected a few men for the purpose. All further attempts by the brigade to launch an attack from Outpost Hill were shattered by fire at their inception, and the brigade in rear was forced to remain in the open under a heavy fire. 10. The position at 3 p.m. was therefore as follows:—The operations of the Desert Column (in effect a "containing attack ") were meeting with all the success which had been anticipated. A serious enemy counter-attack had been checked and driven back. The 54th Division, on the right of the main attack, had progressed, in spite of determined opposition and heavy casualties, as far as was possible until a further advance of the 52nd Division should prevent the .exposure of its left flank. Reports received from the 54th Division stated that the situation was satisfactory, and that no help was required in order to enable the ground gained to be held until further progress by the 52nd Division should render practicable a renewal of the advance. I should like to state here my appreciation of the great skill with which General Hare handled his fine division throughout the day. The 52nd Division was unable to advance beyond Outpost Hill. Middlesex Hill, and a large area of extremely broken ground west and north-west of it, had been made by the enemy exceedingly strong. The nests of machine guns in the broken ground could not be located among the narrow .dongas, holes and fissures with which this locality was seamed. Partly owing to this, and partly owing to the extent of the area, the artillery fire concentrated upon it was unable to keep down the enemy's fire when the brigade on Outpost Hill attempted to advance. The Reserve Brigade of the 52nd Division had not been employed, and the remaining brigade was in position ready to attack Green Hill and Ali Muntar as soon as the progress of the brigade on Outpost Hill on its left should enable it to do so. Up to this time, therefore, only, one brigade of the 52nd Division was seriously engaged. The conformation of the ground, however, was such that the attack on Outpost and Middlesex Hills could only be made on an extremely narrow front. It is possible that if the General Officer Commanding, Eastern Force, had now decided to throw in his reserves, the key of the position might have" been taken with the further loss of between 5,000 and 6,000 men, but this would have left my small force, already reduced, with a difficult line of front to hold against increasing reinforcements of the enemy, who, owing to the conformation of the terrain, could attack from several directions. As it was, the General Officer Commanding, Eastern Force, in view of information received that our attack had not yet succeeded in drawing in the enemy's reserves, decided that the moment had not yet come for an attempt to force a decision by throwing in the general reserve, though he moved a brigade of the 74th Division up to Mansura, so as to be ready to press home this attack of the 52nd Division whenever required. At 3.30 p.m. an enemy counter-attack against the left of the right brigade, 54th Division, was shattered by our shell fire with heavy loss to the enemy, but otherwise no change occurred in the situation till 6.20 p.m., when the brigade on Outpost Hill was forced to evacuate the hill. Since it was evident that the action could not be brought to a conclusion within the day, at 4 p.m. I issued, personally, instructions to General Officer Commanding, Eastern Force, that all ground gained during the day must, without fail, be held during the night with a view to resuming the attack on the Ali Muntar position under cover of a concentrated artillery bombardment at dawn on the 20th. The position at nightfall was that the 53rd Division held the Sampson Ridge—Sheikh Ajlin line; the 52nd Division on its right was facing north towards Outpost Hill and Ali Muntar; the 54th Division carried the line south-eastwards and southwards round the Sheikh Abbas Ridge to El Meshrefe, whence the mounted troops continued the line southwards to the Wadi Ghuzze. Our total casualties had amounted to some 7,000. During the night of the 19th—20th I received a message from General Dobell to say that, after careful deliberation and consultation with all divisional commanders, he was strongly of the opinion that the resumption of the attack ordered for the following morning did not offer sufficient prospect of success to justify the very heavy casualties, which such an operation would, in his opinion involve. He therefore urgently requested my sanction to cancel the instructions previously issued and my approval for the substitution of orders for the consolidation of the positions already gained, to be carried out on the 20th, with a view to a further attack on the enemy's line at pome point between Gaza and Hereira as and when an opportunity might offer. In view of the strongly expressed opinion of the General Officer Commanding, Eastern Force, supported by the General Officer Commanding, Desert Column, and the divisional commanders, I assented to this proposal. 11. The ground gained by the end of the 19th April was consolidated during the 20th. No ground, in fact, gained on that day has since been lost, and the position to which we then advanced has facilitated, and will facilitate, further operations. The enemy, contrary to my expectations, made no general counter-attack on the 20th, and all his local counter-attacks were easily repulsed. One counter-attack was nipped in the bud entirely by our aircraft; a reconnaissance machine having detected about 2,000 infantry and 800 cavalry gathered in the Wadi near Hereira; four machines immediately attacked this force, which they found in massed formation, with bombs, and the entire body was dispersed with heavy casualties. On 21st April, General Dobell visited me at my Advanced General Headquarters to discuss the situation. He repeated that in his opinion, which was confirmed by that of all his subordinate commanders, in view of the great strength of the positions to which he was opposed, the renewal of a direct attack with the force at his disposal would not be justified by any reasonable prospect of success. He was most strongly of the opinion that deliberate methods must be adopted, and that even the assumption of trench warfare might be necessary, pending the arrival of reinforcements. After full discussion, and not without considerable reluctance, I assented to this change of policy. In the meantime, it became apparent to me that General Dobell, who had suffered some weeks previously from a severe touch of the sun, was no longer in a fit state of health to bear the strain of further operations in the coming heat of summer. To my great regret, therefore, I felt it my duty to relieve him of his command, and to place the command of Eastern Force in the hands of Lieut. - General Sir Philip Chetwode, Bt., K.C.M.G., C.B., D.S.O. General Chetwode was succeeded in command of the Desert Column by Major-General Sir H. G. Chauvel, K.C.M.G., C.B. ; and Major-General E. W. C. Chaytor, C.B., C.M.G., succeeded to the command of the Australian and New Zealand Mounted Division. Accordingly, on the morning of the 21st, I interviewed General Dobell and informed him of my decision, in which he concurred. I then interviewed General Chetwode, and instructed him to relieve General Dobell in the command of Eastern Force. 12. The enemy continued to receive reinforcements for his units and additional troops, so that early in May I estimated that he had nearly six infantry divisions in his front line, while his total force in this theatre might amount to eight divisions. There was no doubt, moreover, that he had lately received considerable reinforcements in artillery and machine-gun units, as well as in mounted troops. Throughout the month he continued to strengthen his positions between Gaza and Hereira, and began to build a military branch line from El Tine, on the Central Palestine Railway, towards El Mejdel, north of Gaza. As the result of recent operations I was closely in touch with the enemy on a front of some 14,000 yards from Sheikh Ajlin, on the sea, to the north-eastern corner of the Sheikh Abbas Ridge. From that point my line turned back through Sharta towards the Wadi Ghuzze; with the right flank extended to Shellal in order to protect my southern flank and to deny to the enemy the valuable supplies lying in the Wadi at that point. In the meantime, arrangements had been made to construct a branch line of railway as rapidly as possible from Rafa to the neighbourhood of Shellal. 13. From 6th May the defensive line from Sheikfi Ajlin to Tel el Jemmi was reorganised into two sections, to be held on a regular system of reliefs. Cavalry patrolling was actively carried on by the mounted troops, who frequently came into contact with the enemy's mounted patrols to the east and north-east. During the earlier part of May, the enemy aircraft made several attacks with bombs on Deir el Belah and other points near the front line. The Royal Flying Corps made effective retaliation against Ramleh and Sheria, and as the month advanced the enemy's activity diminished in this respect. During May, also, our heavy batteries, with the co-operation of the Royal Flying Corps, made very effective practice on enemy batteries in tire neighbourhood of Gaza. The only event, however, of any note during this month was a cavalry raid carried out on the 23rd and 24th May against the Bir Saba—Auja Railway, with the object of preventing the enemy from recovering and using its material for the construction of his branch line from El Tine to Mejdel. The plans for this operation necessitated the movement of one mounted brigade and demolition parties to Bir el Esani, 10 miles W.S.W. of Bir Saba on the Wadi Shanag, during the afternoon before the raid took place. Since this movement could not be concealed, it was arranged that an artillery demonstration should take place on the left flank in order to draw the enemy's attention from the movement on Esani, and place him in doubt as to our intentions. For three days previously the artillery carried out wire-cutting on the Gaza defences, and the enemy's repairing parties were kept under artillery and*machine-gun fire. The artillery demonstration was made more intense during the afternoon of 22nd and the early morning of 23rd May. This demonstration was very successful in making the enemy apprehensive on his right, and he appears to have suffered a considerable number of casualties. On the afternoon of the 22nd, one brigade of the Australian and New Zealand Mounted Division, with demolition parties from the field squadrons of both mounted divisions, moved to Esani. During the night of the 22nd/23rd. this force marched on the railway at Asluj and Hadaj by way of Khalasa. Khalasa was surrounded during the night and no opposition was met with there. The demolition parties reached their positions on the railway line just before 7 a.m. on the 23rd. The Imperial Camel Corps left Rafa early on the 22nd and marched approximately down the Turco-Egyptian frontier on Auja. Owing to the difficulties of the country the Imperial Camel Corps demolition party was unable to begin work on the railway before 11.45 a.m. on the 23rd. The demolition parties had previously been thoroughly trained and their work, once begun, was carried out with great rapidity. Those of the mounted divisions completed the destruction of the railway from Asluj to Hadaj —about 7 miles—by 10 a.m. The destruction of this portion of the line made interference with the work of the Imperial Camel Corps practically impossible. The demolition party of that corps, therefore, had time to complete the destruction of six miles of railway eastward from Auja during the day. Thus 13 miles of railway line were completely destroyed, each pair of rails being cut in the centre. One 6-span bridge near Hasaniya, one 12-span bridge over the Wadi el Abiad, a viaduct over the Wadi Theigat el Amiria, and (between Thamiliat el Rashid and Asluj) one 18-arched bridge, one 5-arched bridge, one 3-arched bridge, one 2-arched bridge and two culverts were completely destroyed. All the points and switches at Asluj Railway Station were destroyed. A considerable number of telegraph posts were cut down, wires cut and insulators broken. A quantity of decauville material near Hadaj was destroyed. Finally, a large stone building near Wadi Inkharuba was demolished, with quantities of sandbags, timber and matting. While this work was in progress, the mounted divisions of the Desert Column carried out a demonstration towards Bir Saba and Irgeig. The divisions marched by night on the 22nd/23rd, and during the 23rd carried out a tactical and water reconnaissance of the area immediately west and north-west of Bir Saba. A Heavy Battery, R.G.A., was moved forward behind this force and shelled the viaduct at Irgeig. The withdrawal of the mounted troops was effected without difficulty, the enemy showing no signs of activity. The Australian and New Zealand Mounted Division met a few Arab snipers. One armed Arab was killed and 13 prisoners were taken. The Imperial Mounted Division encountered only slight opposition from small parties of enemy cavalry. Our casualties were one man wounded. During this operation crops which could not be brought in and which would otherwise fall into the hands of the enemy were destroyed by our troops. It is estimated that 120 tons were burnt during the day. One of our aeroplanes employed for inter-communication between Desert Column Headquarters and the Imperial Camel Corps was damaged in attempting to land near Auja. The Imperial Camel Corps therefore remained at that place for the night 23rd/24th, and personnel of the corps succeeded in repairing the aeroplane, the loss of which was thereby avoided, and which returned safety to the aerodrome on the 24th. For the month of June there is nothing of special note to record, the period being mainly one of energetic preparation for further operations. For the time being, the infantry in the northern part of the line were confined to trench warfare, to which the troops soon adapted themselves, while to the south and south-east our cavalry patrols were daily in touch with the enemy. 14. During the period covered by this report, the situation on the Western front has been such as to call for little comment. The light armoured motor batteries, light car patrols and Bikanir Camel Corps, have been able to keep the whole front free from disturbance. The route from Sollum to Siwa has now been improved, so that Siwa can be reached by car from Sollum in a single day. No incident has occurred in the Southern Canal Section. The extent of the Northern Canal Section increased continuously as the Eastern Force advanced, and at the beginning of May this command was reorganised as that of the General Officer Commanding, Palestine Lines of Communication Defences. This command now extends from the northern part of the Suez Canal to Khan Yunus, and includes the responsibility for the defence of almost the whole length of the military railway and pipelines. Except for attacks by hostile aircraft, no enemy attempts have been made against the lines of communication, but between 7th and 11th May a small force from this command, consisting of two companies Imperial Camel Corps and a field troop, made a successful expedition to El Auja, Birein and Kossaima, for the purpose of blowing up the wells and water supply at those places to the utmost possible extent. The force met with no opposition, captured five prisoners and completed successfully the demolitions, including that of the railway bridge north-east of El Auja. I have great pleasure in recording the addition to the force under my command of a French detachment under M. le Colonel Piepape and of an Italian detachment under Major da Agostino. At the end of May I was most happy to welcome in Egypt M. le General Bailloud, who came as inspector of French troops in Northern Africa to inspect the French detachment. At the beginning of May it became necessary to reorganise the administrative services on the Eastern Lines of Communication, owing lo the increasing size of the Eastern Force. An inspector, Palestine Lines of Communication, was therefore appointed. His headquarters were established at Kantara on 2nd May and the advantage of this appointment has been proved by the increased efficiency of the lines of communication services east of the Canal. 15. In conclusion, I should like to place on record my appreciation of the magnificent work done by all the fighting troops before Gaza. No praise can be too high for the gallantry and steadfastness of the cavalry, infantry, artillery, Royal Flying Corps and all other units which took part in the two battles. Particular commendation is due to the infantry. The 52nd, 53rd and 54th Divisions, though actively engaged for over a year in the Sinai Peninsula, had not, since their reorganisation after the operations in the Dardanelles, been able to show how they had improved out of all knowledge in training and discipline and in all that goes to make up an excellent fighting organisation. Under severe trial they have now given ample proof of the finest soldierly qualities. It is hardly necessary to reiterate the praises of the Australian and New Zealand mounted troops, who have always come up to their high reputation, and their comrades in the mounted yeomanry have shown themselves to be endowed with the same bravery, vigour and tenacity. The Imperial Camel Corps, manned by Australian, New Zealand .and British personnel, has proved a corps d'elite, possessed with a quite remarkable spirit of gallantry. The distinguished service rendered by the troops from India is deserving of high commendation. Units of the Indian Regular Army, mounted and dismounted Imperial Service troops and the Bikanir Camel Corps have shown soldierly qualities in action, discipline and endurance; and I wish to record the unfailing devotion to duty of the battalions in garrison in Egypt and to the British West Indies Regiment. The Camel Transport Corps and the Egyptian Labour Corps—two units raised in this country —are worthy of the warmest praise for their untiring labours, under the severest conditions, in close conjunction with the fighting troops. The health of the troops has throughout been singularly good. All branches of the medical services, under Surgeon-General J. Maher, C.B., deserve the highest commendation for their successful work at the front, on the lines of communication and in the base hospitals. The presence in the force of a number of civil medical consultants, who have so patriotically given their services, has been of the very greatest value, and they have worked in successful accord with the regular medical services of the Army. The Australian Army Medical Corps and the New Zealand Medical Corps have also been remarkable for their efficiency and unremitting devotion. The workings of the supply and transport services have had to take into account quite abnormal conditions, both of supplies available and terrain, involving in some cases complete reorganisation of unite to suit local conditions. In spite of this, the functions of these services have been discharged in a most admirable manner, and great credit is due to the Director, Brigadier-General G. F. Davies, C.M.G., and to all ranks under him. The same local conditions above referred to have rendered the force more than usually dependent on animal transport, while operations have involved the use of important mounted forces. The remount and veterinary services have consequently held a vital place in the organisation, and they have carried out their respective tasks to my complete satisfaction. I have, in a previous despatch, brought to notice the admirable work of the Signal services, and I need only now add that this service has continued in its efficient and highly satisfactory condition. The work done by the engineer services and the works directorate deserves high commendation. There is, perhaps, no department which has a greater influence upon the morale of an Army than that of the Chaplains' Department. The thorough and self-sacrificing manner in which chaplains of all denominations, under the principal chaplain, Brigadier-General A. V. C. Hordern, C.M.G., have carried out their duties, has earned the gratitude of all ranks. The impossibility of granting leave home on any extended scale has rendered the Army in the Field dependent on rest camps and voluntary institutions for that rest and relaxation so necessary in view of the arduous conditions of campaigning in the desert and in tropical heat. I wish to take this, my last, opportunity of expressing the thanks of the whole Field Force to those ladies and gentlemen who have done so much to obviate the deprivations imposed on it by those conditions. Especially are they due to the Church Army and the Young Men's Christian Association, whose recreation huts are provided, not only in the rest camps, but also throughout the front. It would be hard to exaggerate the value of these institutions, both in sustaining the morale and the health of the troops. The dealing with reinforcements and material arriving from England, the transference of such large numbers of troops to other theatres of war, the keeping of records thus affected and the registration of casualties and evacuation of sick and wounded, have thrown very heavy work on the base ports. The staffs responsible for these matters have discharged their arduous duties with marked efficiency, frequently under difficult climatic conditions and abnormal pressure. In spite of the important operations in progress during this time, military training has been continued with undiminished vigour. The Imperial School of Instruction at Zeitoun has by now passed over 22,000 officers and non-commissioned officers through its hands. A staff school was started early in the year for the training of junior staff officers. Three courses, each of about six weeks, were held at this school for which accommodation was found just outside Cairo, the number of candidates at the first two courses being shared between this force and the Salonika Force, while the last course was confined to the Egyptian Expeditionary Force. The results of these courses have been exceedingly useful, and the instruction has been extremely well carried out. His Highness the Sultan has, throughout the period of my command, given me valuable encouragement and wise counsel, based on his unrivalled knowledge of Eastern affairs. I wish once more to thank His Excellency The High Commissioner, General Sir F. R. Wingate, G.C.B., G.C.V.O., K.C.M.G., D.S.O., for the ready assistance and quick sympathy which he has given me in all my work; all branches of the Civil Government of Egypt have assisted the Forces in the Field with unfailing readiness. My gratitude is also due to Vice-Admiral Sir Rosslyn Wemyss, K.C.B., C.M.G., M.V.O., Commander - in - Chief, East Indies and Egypt, for his part in securing the unfailing co-operation of the Royal Navy at all times; and I wish to make special reference to the admirable and gallant work done by the Naval Air Service, which has been of the greatest assistance to my operations. My Chief of the General Staff, Major-General Sir Arthur Lynden Lynden-Bell, K.C.M.G, C.B., has given me unvarying and loyal support at all times. He has proved himself an ideal Chief of the General Staff, combining a thorough knowledge of his duties with an activity and an energy that overcomes all difficulties. He has earned the confidence of all ranks. Major-General John Adye, C.B., has been an excellent Deputy Adjutant-General, having great knowledge of all administrative work and sound judgment. He has been of the greatest assistance to me. Major-General Sir Walter Campbell, K.C.M.G., C.B., D.S.O., my Deputy-Quartermaster-General, is an organizer of great general ability, very sound and hardworking. I owe a great debt of gratitude to this officer. The General Officer Commanding, Eastern Force, Lieut.-General Sir P. W. Chetwode, Bt., K.C.M.G., C.B., D.S.O., has united the qualities of brilliant leadership and sure judgment, and has invariably inspired confidence in all ranks. The labours of a Commander-in-Chief in the Field are considerably lightened when the complex and difficult duties which fall to the military secretary are ably discharged. In this respect I have been fortunate. Lieut.-Colonel S. H. Pollen, C.M.G., is an officer of outstanding ability and sound judgment, and the manner in which he has carried out his duties has greatly contributed to the smooth working of the staff, and is beyond praise. I am submitting, in a further despatch, the names of officers, non-commissioned officers and men and others whom I wish to bring to notice for gallant and distinguished service during the period under review. Commanding - in - Chief, Egyptian Expeditionary Force.